Why Overeating Should Not Be a Holiday Tradition | Gastrointestinal Specialists, Inc.
For many, overeating is just another holiday tradition. After indulging in a cornucopia of foods high in fat and sugar, we sit around complaining of fatigue, heartburn, bloating, and gas. But the effects of overeating aren’t just temporary discomfort. Studies show that overeating is a cycle that often doesn’t stop with Thanksgiving or Christmas. A study by Cornell University found that individuals weigh the least in October, and gain weight throughout the holiday season. Even worse, weight gain in the 10 week holiday season takes an average of 5 months to come off. Overeating can quickly become a habit, and has lasting effects such as weight gain, higher body fat content, higher blood sugar, and higher cholesterol levels. The signals that your body sends to say that it is full take approximately 20 minutes to register with your brain, so take your time while eating to avoid accidental overindulgence. This may sound counterintuitive, but eating in smaller quantities more often keeps you comfortably full, as opposed to waiting until you are ravenous and quickly overindulging. A good guideline is to eat a small, balanced meal about every 4 hours. Don’t make the mistake of overloading your plate, give yourself small portions but allow yourself to go back for seconds. As children, many people are told to finish everything on their plate, but this often leads to a habit of overeating. To compensate, give yourself small portions, so that you make a conscious decision before going back for a second helping. 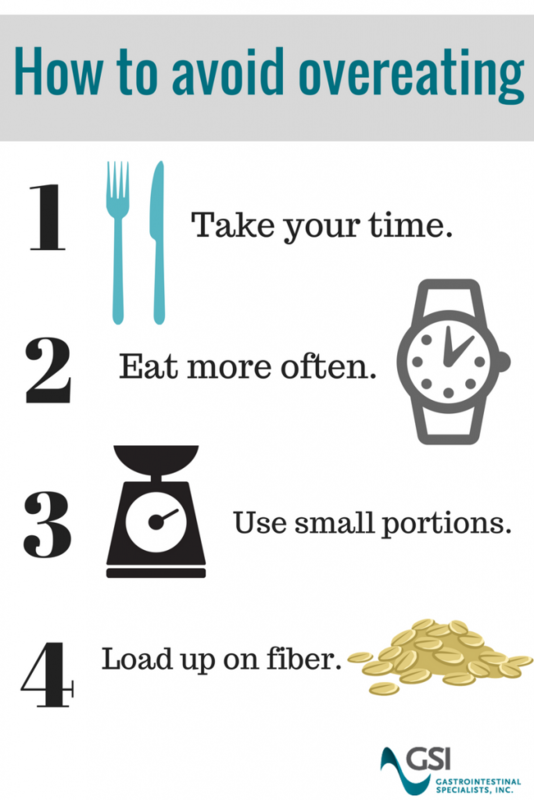 Foods rich in fiber make you feel more full and satisfied. Try to eat some oatmeal, beans, or nuts to feel more full throughout the day. For a complete list of high-fiber foods, visit Mayo Clinic. If you are regularly experiencing the uncomfortable symptoms of overeating, such as heartburn, bloating, gas, and fatigue, consider making an appointment.